Kenn Gartner, Ph.D., has lived his dream of performing and conducting in over 70 countries. 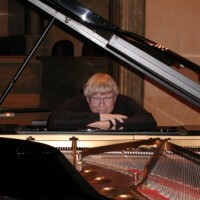 Dr. Gartner's accomplishments include concerts, special performances, directing choral groups, teaching piano and voice, and special teaching venues in China and other countries. He has earned the respect and admiration of students, artists, musicians, and members of the general music community for over 70 years. He started playing piano at the age of three. Dr. Gartner's professional recognition, awards, and honors are far too numerous to mention and should be explored further in his personal website, kenngartner.com. He was a music headliner in New York and internationally for many years, and now makes his home in California where he continues his teaching and performing. In addition to performing as pianist, soloist, and accompanist, he has performed opera and conducted many choral ensembles in the U.S. and abroad. As an educator, Dr. Gartner's various roles include music theater director, organist/choirmaster, music department chairman, professor, major group choral adjudicator, and visiting artist. One of his most significant accomplishments was leading the first New York City vocal chamber ensembles to perform at famed Lincoln Center. Since starting his own company, Dr. Gartner has evolved to produce diverse musical events for a broad audience. World traveled, he speaks English, French, German and some Japanese, Spanish, and Korean. He expects to continue his music and entrepreneurship activities for many years to come.